What a great week! We covered a lot of ground so that we can be ready for the holiday break. Thanks so much for sending in your recyclable shapes. They really enhanced our geometry unit. In reading this week we read The Mysterious Giant of Barletta. We focused on drawing inferences and following directions from the text. Some students struggled with inferring details based on contextual clues. Try asking your children to make inferences about hidden details from the stories you're reading at home. We finished the rough drafts of our Critter Adaptation paragraphs and started typing the final drafts. We focused on using more specific verbs and understanding the difference between physical and mental verbs. In science, we learned about the sources of electricity. The students identified different electricity sources in our classroom and we read about how to store electricity. We started building Geometry City for math this week. Each day we added new elements to the city based on the specific geometric lesson of the day. The biggest struggle for the class has been understanding acute and obtuse angles. We'll be focusing more on them next week. In social studies we studied the top inventions of 2012 and some key inventions from the past. We discussed their impact on society and the important role they play in our lives. Reading: Studying versions of The Elves and the Shoemaker. Writing: Doing our first creative narrative on snowmen. Science: Looking at the conversion of energy. Math: Continuing our Geometry unit with a test on Thursday. Social Studies: Studying the highlights of 2012. Students have the option of participating in our Secret Elf program next week, where they're assigned one person in the class and need to do nice things for them on Tuesday and Wednesday. Then on Thursday they will bring a small gift that costs less than $5. The following student's numbers represent those who would like to participate: 1, 2, 3, 4, 7, 8, 9, 10, 11, 12, 13, 14, 15, 16, 17, 20, 23, and 25. If your student did not sign up, but has changed their mind, please email me before Sunday night. Assignments will go out on Monday afternoon. Have a wonderful, rainy weekend! It was great meeting with all of the parents for conferences last week. We had a very busy and exciting week in the classroom. Here's a quick recap of what we've been working on. In reading, we focused on Trickster Tales from around the world. Each group was assigned a different Trickster Tale to perform on Friday. They designed props and wrote scripts to present to the class. We've been up to a lot in writing. First, we turned out cranberry facts into expository paragraphs. 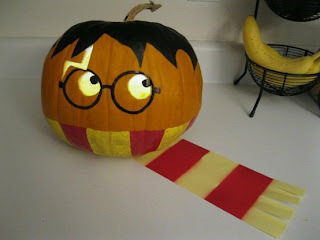 This tied wonderfully into the cranberry extravaganza we had with our buddies. Most of the class has completed the rough draft of this paragraph. Then we learned about similes and wrote a simile poem. In Math, we completed Unit 9, which was on division strategies and concepts. Creating division stories was the most challenging aspect for our class. We've been focusing on adaptation in Science. We're drawing our own custom critters who have gone through adaptations. In social studies, we've taken our presidential reports and started turning them into persuasive paragraphs. The students are working on identifying the important characteristics of their presidents so they can try to convince the class that their's is the best president. Reading: We read the selection Dancing Rainbows and we wrapped up our second unit on Celebrations and Traditions. Math: We finished Topic 8 and took our test on Multiplication Strategies. Please continue to practice your multiplication facts at home. Science: We took our Life Cycle Test and we published our field guides. Writing: We completed our Jasper Ridge Expository paper. We also published our Flat Me projects and worked on how to use quotation marks. Social Studies: We reviewed the purposes of presidents and the branches of our government. We also began brainstorming on an expository paragraph about those branches. If you haven't already, please fill out the parent teacher conference survey before your conference. I urge you to be on time to your conference so we can utilize the whole 20 minutes. Math: We finished up Topic 7 on Multiplication Facts. We also started Unit 8, which covers some of the more difficult multiplication facts. 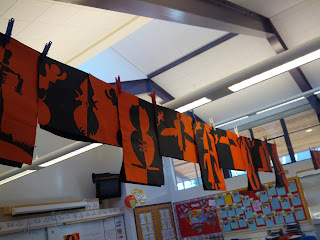 Reading: We took our Theme 2 Tests and we read the selection, The Talking Cloth. We were focusing on the skill of identifying details. We also completed the teacher read aloud of one of the class's favorite novels, The Big Friendly Giant. Writing: We learned how to write a better Power Number Topic Sentence. We used that skill to influence our expository writing on Jasper Ridge. We made it to the rough draft stage on that project. Science: We studied live Crayfish! The students had a great time analyzing their new friends. We focused on the skills of observation and adaptation. Social Studies: We continued our understanding of the election process. Each student had the opportunity to vote for one of the presidential candidates and Obama won 20 to 3, a slightly stronger win for Obama than the rest of the country. Each student is also assigned to one historical president and has been working on a presidential flashcard. Please remember to take the parent teacher conference survey before Tuesday. 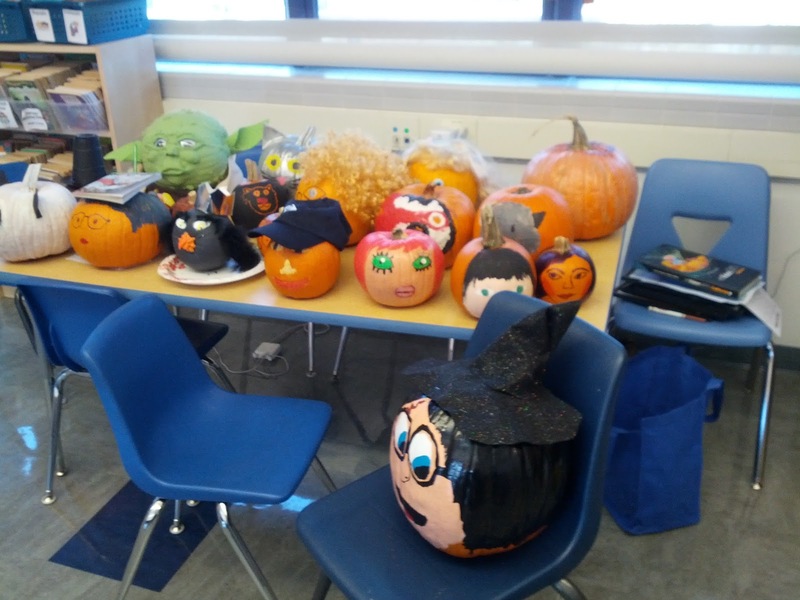 Also, don't forget to bring your scarecrows on Tuesday. Reading: We read Anthony Ramos: Born to Rope and worked on the comprehension skill of categorization. 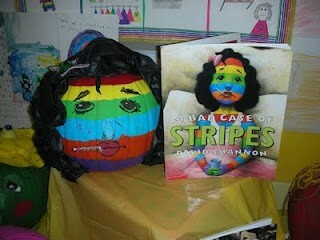 We also had some fantastic book report presentations on their painted pumpkins. Writing: We focused on nouns and integrated our categorization skills into proper nouns, common nouns, and pronouns. 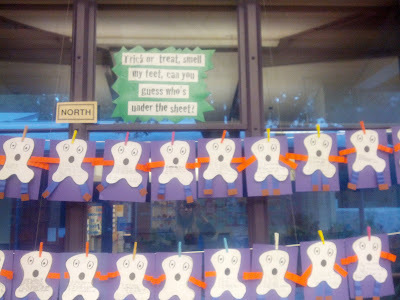 We started writing a Jasper Ridge paragraph and another on Halloween candy. We decided to recycle the word "Awesome" and developed a list of synonyms that we will be using from now on in our writing. Math: We continued our Unit 7 studies and did some fun problem solving activities. Science: We had an adventure at Jasper Ridge and many students found the plants and animals we've been working on in our field guides. Their favorite was the banana slug! Social Studies: We started our government unit, focusing on elections. We began to talk about what a President and the Branches of Government can do. Each student was assigned a president to research. Eventually, they will write a paragraph about that president. On Friday, it came to our attention that there was bullying going on about who the students were planning on voting for. I talked to the students about tolerance. Please reenforce this at home and help them see that everyone's opinion should be treated with respect. Math: We finished up our subtraction unit and took the test on subtraction with regrouping. We also started unit 6. It covers multiplication concepts. So far we have adressed repeated addition, arrays, and the communicative multiplication property (3x4 equals 4x3). Reading: We finished The Chalk Box Kid and did some related art. Writing: We are finishing typing our Flat Me projects. We completed rough drafts for our buddy expository paragraphs and are in various stages of writing "It drives me batty when..." papers. 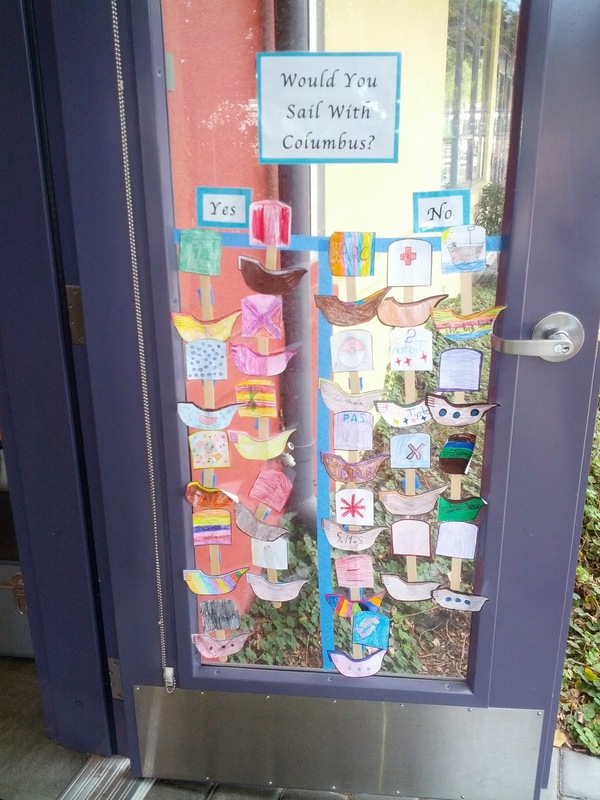 Social studies: Everyone has now cast their votes on sailing with Columbus! We have 10 adventurers who would sail to the unknown and 12 who would stay home. We drew maps of our classroom this week and linked our map skills to math by plotting coordinates that built a Jack-o'-Lantern picture. Science: We continued our Field Guides and had a hands-on presentation about Jasper Ridge that included dissecting owl pellets. We also continued to monitor our bean growth. Reading: We will start Theme 2 in reading, which focuses on traditions and various cultures. Math: We will continue on into unit 6 and the wonders of multiplication. Writing: We will work on publishing our Kinder Buddy Papers. Students will dive into the world of revision with their Batty Papers. 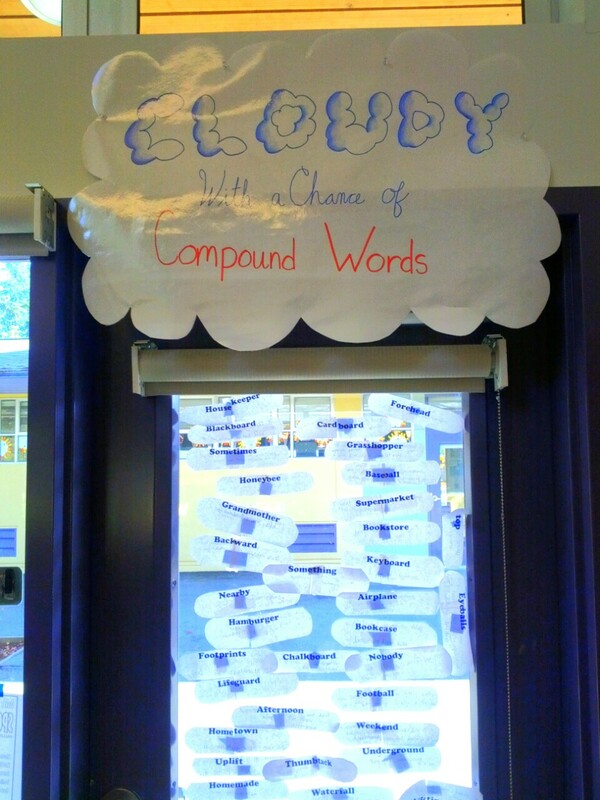 We will focus on compound words and common nouns this week as well. Social Studies: We will focus on the Compass Rose in finding directions. Science: We will continue our field guides and bean observation. Reading: We continued reading The Chalk Box Kid and focused on the skill of visualization. To practice this skill, the students drew what they saw while I read a few chapters from the book. Then, they worked on chalk gardens using support from the text to guide their illustrations. Be sure to have you students practice visualization while they D.E.A.R each night. This can be done by asking them what pictures are being painted in their minds. Writing: We are working on paragraph organization and made some nice progress. We also finished our instructional writing project on how to chew bubble gum. They had a lot of fun exploring their creativity with that one. Math: We are about to wrap up our subtraction unit. This week a few students struggled with regrouping in subtraction. Particularly, when it had to be done multiple times to solve the problem. For some students, it seemed to be a conceptual gap where they didn't understand why you can regroup. If you find your students struggling, try practicing with a place value chart and show your students that the number is the same when you regroup, you just adjusted the value in each place. Science: We are continuing to chart our bean growth, and the gentleman's beans seems to be growing much faster than the lady's, but the girls are hoping for a comeback. We also started our field guides on various plants and animals in the diverse ecosystems of California. Social Studies: This week we focused on Columbus. Students used a timeline of Columbus' life as well as the atlas to answer questions about his life and track his route. They also did some searching in the dictionary for less familiar terms. We are ending our Columbus unit by answering the question "Would you sail with Columbus?" Students were assured that a vote in favor of the voyage did NOT mean they wanted to be mean to the native people they encountered in the new land, just that they had an adventurous spirit. So far 20 votes have been cast and we are tied at 10 to 10. With 4 votes to go, we will see what happens Monday. Reading: We will finish The Chalk Box Kid and have a comprehension quiz for it on Thursday. Writing: We are continuing to work on Paragraph organization and will work on extending some paragraphs that are lacking development. Math: Our Unit 4 test will be on Tuesday. Wednesday will mark the beginning of Unit 6 on Multiplication concepts. This is the first of the three multiplication units. Science: We are continuing to map our bean growth. We will also continue to work on our field guides. Social Studies: We are going to transfer some of our map skills to other subject matter and focus a bit more on using the Compass Rose for direction. We are also going to look at California through the lens of our field guides. Permission Slips: I have received the impact wavier from nearly everyone in our class, but I only have half of our District required permission slips for Jasper ridge. I attached the form to the email I sent out to everyone about project cornerstone. Please let me know if you need me to send it to you again. I don't post any of the field trip forms on the website for the protection of the students. As a district, we don't think it's safe to publicize the location and day we are traveling off campus with students. What a great week last week! In reading, we worked on our first novel in the third grade called The Chalk Box Kid. Our writing skills revolved around expository skills, understanding root words, and a continued study of compound words. We also tied our writing abilities to our social studies by doing a direction writing assignment on "how to chew bubble gum." In social studies, we continued our exploration of maps and indexing. We did an exciting sidewalk chalk city development exercise out on the blacktop that the students really got in to. Our math studies were from Unit 4 on subtraction and in science, we continued to chart our bean growth. The field trip to see Sleeping Beauty was a lot of fun for everyone. It was also great to see so many of our students participating in the Cardboard Challenge. What a creative bunch of children! What a great week! We had our second science lesson, where we looked at various seeds and drew scientific drawings. We even got to dissect fava beans! The students had a lot of fun with it. We also had our first math unit test and ended up with a class average of 80.2% (which is an S). The test will come home on Monday, and if your child received a score below a 65% (which is an N), there will be practice worksheets attached to the back. Additionally, we had our first reading section test, which had an average score of 7.8. The first two questions required the students to write complete sentence answers that included the context of the question being asked. I instructed the students on this tactic and had them practice it right before the test. Many students still struggled with it, so we'll continue to focus on it moving forward. I posted the 'Math Facts - Addition and Subtractions' test under the math section of the Resources Tab. The students will take this same test in two weeks. Book orders are online and ready to be purchased! I placed instructions as the first item on the Resources Tab. Don't forget to use the class activation code! New spelling words will be coming home on Monday and attached you will find last week's spelling test. Please keep these at home to practice during the week. We'll be starting our next unit in math. It focuses primarily on rounding. We'll have a test on the material on Friday. Library time starts this week. We'll also start writing our Pen Pals this week. Walk or bike to school day is on Tuesday. Have your students take the next poll! What a fantastic 1st week of school! It was great meeting all of you and your wonderful students. A lot of time was spent getting to know each other and building our classroom community. 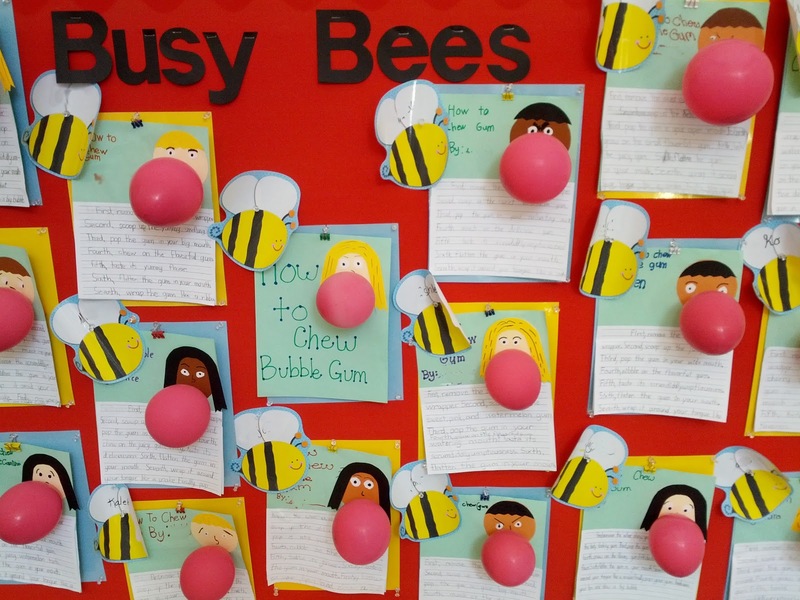 We set several personal and classroom goals, and will be checking in on them throughout the year. Students, bring your "What's my Bag?" assignments on Monday. Students also must sign and return the "Oak School Behavior Contract" on Monday. 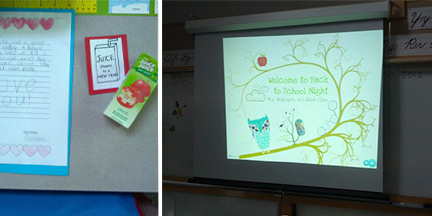 Parents, Back to School Night is on Wednesday 8/29. There is a community meeting for all grades at the flag poll at 7:15pm and my classroom presentation will follow from 7:30 - 8:00pm. Wednesday is a minimum day. School ends at 12:15pm. We'll also be kicking off our Starting Arts program this week! We're starting our weekly poll for the students. They can vote now until Friday and we'll reveal the results during our class meeting. You can find the poll to the right of this post. Hello Students and Parents! 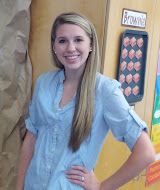 I'm so excited to have you in my class this year. We're going to have a great time together as we learn about everything from cursive to times tables. I have a lot of wonderful plans for the year and can't wait to get started this Wednesday at 8:15am. Get ready to work very hard and also have a lot of fun. This site is your resource for understanding what's going on in the classroom and how you can help out. Parents, please review the checklist tab above, so you know what materials you'll need by the end of the first week. Also, feel free to fill out the volunteer form and let me know when you're available to come help out in the classroom. Please come back regularly for new updates on important dates, projects we're working on, and helpful student resources. I'm always available by phone or email and promise to get back to you very quickly.